Most software vulnerabilities derive from a relatively small number of common programming errors that lead to security holes [55,37,27,50]. According to SANS (Security Leadership Essentials For Managers)1 two programming flaws alone were responsible for more than 1.5 million security breaches during 2008. Although computer security is nowadays standard fare in academic curricula around the globe, few courses emphasize secure programming techniques . For instance, during a standard introductory C course, students may not learn that using the gets function could make code vulnerable to an exploit [43,33]. The situation is similar in web programming. Programmers are not aware of security loopholes inherent to the code they write; in fact, knowing that they program using higher level languages than those prone to security exploits, they may assume that these render their application immune from exploits stemming from coding errors. One common trap into which programmers fall concerns user input, assuming, for example, that only numeric characters will be entered by the user, or that the input will never exceed a certain length. Programmers may think, correctly, that a high-level (usually scripting) language in a web application will protect them against buffer overruns. Programmers may also think, incorrectly, that input is not a security issue any more. That is wrong. Their assumptions can lead to the processing of invalid data that a malicious user can introduce into a program and cause it to execute malicious code. This class of exploits are known as code injection attacks (CIAs). In this article we present an approach that counters a specific class of cias in a novel way. they span a wide range of security and privacy issues, like viewing sensitive information, destruction or modification of sensitive data, or even stopping the execution of the entire application. Despite many countermeasures that have been proposed the number of CIAs has been increasing.2 Malicious users seem to find new ways to introduce compromised embedded executable code to applications by using a variety of languages and techniques. Figure 1 presents a taxonomy of CIAs, divided in two basic categories. The first involves binary code and the second executable source code. Binary code injection involves the insertion of binary code in a target application to alter its execution flow and execute inserted compiled code. This category includes buffer-overflow attacks [19,33], a staple of security problems. These attacks are possible when the bounds of memory areas are not checked, and access beyond these bounds is possible by the program. By taking advantage of this, attackers can inject additional data overwriting the existing data of adjacent memory. From there they can take control over a program, crash it or, even take control of the entire host machine. C and C++ are vulnerable to this kind of attacks since typical implementations lack a protection scheme against overwriting data in any part of the memory. Specifically, they do not check if the data written to an array is within its boundaries. In comparison, Java guards against such attacks by preventing access beyond array bounds, throwing a runtime exception. Code injection also includes the use of source code, either of Domain-Specific Languages (DSLs) or Dynamic Languages. 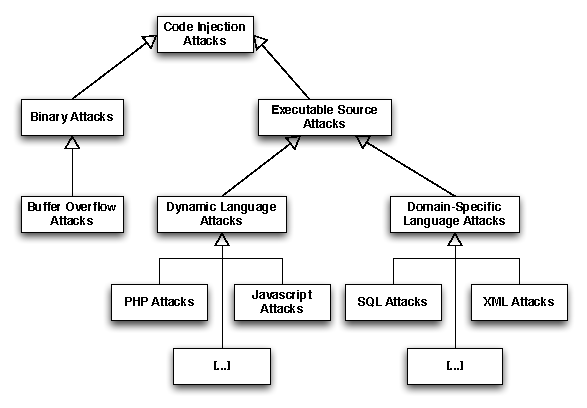 DSL injection attacks constitute an important subset of code injection, as DSL languages like SQL and XML play an important role in the development of web applications. For instance, many applications have interfaces where a user enters input to interact with the application's data, thereby interacting with the underlying relational database management system (RDBMS). This input can become part of a SQL statement and executed on the target RDBMS. then an attacker could view every password in the table by using the string anything' OR 'x'='x as input. Savvy programmers could use a language's libraries, like PHPs mysql_real_escape_string() and detect malformed input; or they could use prepared SQL statements, instead of statement templates. Unfortunately, the number of SQL injection attacks suggest that programmers are not always that careful. The user may pass into the value parameter code that will execute in the server. If value is 10 ; system("touch foo"); then a file will be created on the server; it is easy to imagine more detrimental instances. There are two basic approaches that detect injection vulnerabilities, static and dynamic. A taxonomy of CIAs countermeasures appears in Figure 2. Static analysis involves the inspection of computer code without actually executing the program. The main idea behind static analysis is to identify software defects during the development phase. Currently, there are many modern software development processes that use static checkers for security as their integral parts [6,21,18]. The most straightforward and sensible approach is the adoption of secure coding practices [27,50,37], like the ones we mentioned above to prevent SQL code injection. However, this does not always happen, as programmers may not be aware of them, or time schedules may be tight, encouraging sloppy practices instead. Lexical analysis is a flexible method extensively used to detect buffer overflow vulnerabilities. To do so, a lexical analyzer recognizes character sequences and transforms them into tokens. Then, the resulting tokens are associated with vulnerable function calls susceptible to buffer overflows like gets, strcpy and scanf. This approach is taken by security utilities like ITS4,4 Flawfinder5 and RATS6 [54,10,9,49]. However, these tools suffer from several false positive and negative reports [11,14]. Another static method that is tailored to localize injection vulnerabilities is data flow analysis. Based on control-flow graph (CFG), data flow analysis can be applied to connect unchecked user input with the execution of a code statement that is based on this input and issue a notification about the vulnerability. Pixy and Splint are data flow analysis tools used to detect code injection vulnerabilities in web applications [30,17]. Data flow analysis exhibits less false positives and negatives than lexical analysis but it suffers from a distinct runtime overhead . Wassermann and Su have proposed an approach that deals with static analysis and coding practices [52,53]. Specifically, they automatically analyze the application's source code to locate SQL statement invocations that are considered unsafe. To analyze the code they utilize context free grammars and language transducers . An approach to detect DSL-driven injection attacks involves the introduction of type-safe programming interfaces, like DOM SQL  and the Safe Query Objects . Both eliminate the incestuous relationship between untyped Java strings and SQL statements, but don't address legacy code, while also requiring programmers to learn a radically new API. Syntax embeddings have also been proposed to detect code that is susceptible to various kinds of code injections . This approach embeds the grammar of a DSL language into that of a host language and automatically reconstructs code statements by adding functions that provide security layers. Such an approach is quite interesting since it introduces security features at a very early stage of software development. Dynamic analysis can be seen as the next logical step of static analysis. It inspects the behavior of a running system and does not require access to the internals of the system. On the dynamic front, runtime tainting enforces security policies by marking untrusted data and tracing its flow through the program. For instance, the system by Haldar et al. covers applications whose source code is written in Java, while the work by Xu et al. covers applications whose source code is written in C. A dynamic checking compiler called WASC includes runtime tainting to prevent SQL and script injection . To counter similar attacks, SMask identifies tainted code by automatically separating user input from legitimate code . This is done by introducing specific syntactic constructs that handle server-side languages used for data management separately. Such approaches generally require significant changes to the compiler or the runtime system. Instruction-set randomization (ISR) is another technique that defends against most application-level binary code injection attacks. This technique employs the notion of encrypted software. Kc et al. used ISR to counter different kinds of injection. Their approach is based on the fact that a CIA only succeeds if the injected code is compatible with the execution environment that is created by using a randomization algorithm. The attacker does not know the key to the algorithm and his injected code will not succeed. Hu et al. proposed a software dynamic translation-based implementation of ISR to fortify applications against binary injection attacks. A similar approach was also proposed by Barrantes et al. .
Another dynamic approach that protects applications from SQL attacks involves query modification. Here the modified statement is either reconstructed at runtime using a cryptographic key that is inaccessible to the attacker , or the user input is tagged with delimiters that allow an augmented SQL grammar to detect the attacks [7,46]. Both approaches require significant source code modifications though. Dynamic data-flow analysis is also used to protect applications from CIAs. SigFree is a tool that follows this approach to block binary code injection attacks by detecting the presence of malicious code . This is motivated by the fact that buffer overflow attacks typically contain executables while legitimate client requests never contain executables in most services. Still, this is not always true and this is because the tool suffers from false positives. Finally, some approaches combine static analysis with runtime monitoring. A general hybrid approach involves the identification of SQL injection attacks using the program query language PQL . The PQL queries are evaluated through both a static analysis and the dynamic monitoring of instrumented code. AMNESIA, a tool that also detects SQL injection attacks, associates a query model with the location of each query in the application and then monitors the application to detect when queries diverge from the expected model [25,24]. This idea is related to training approaches, based on the ideas of Denning's original intrusion detection framework . Training approaches record and store valid code statements and thereby detect attacks as outliers from the set of valid statements. An early approach called DIDAFIT recorded all database transactions . Subsequent refinements tagged each transaction with the corresponding application . In this paper, we propose a novel and generic approach of preventing code injection attacks. Our approach can be seen as an improvement of the training approach. To specify if an application is under attack we use a blend of features that is unique for every vulnerable code statement. The key property that differentiates our scheme is that these features do not depend entirely on the code statement, but also take into account elements from its execution context. At the end of the training phase, a model of all legitimate statements is produced. This entails almost zero false positive and false negative rates making our approach robust and effective: at runtime, our scheme checks all code statements for compliance with this model and can thus block the statements that contain additional injected elements. Another distinct advantage of our approach is that it can be easily retrofitted to any system and it does not depend on the entity that is protected. We have applied our scheme in three different cases with promising results. Following our classification, we present an approach that protects against two kinds of source code injection attacks: those that use an application library to execute DSL code and those that exploit the eval function in dynamic languages. Figure 3 illustrates our proposed approach. A proxy application library accepts the request to execute code from the application. The code is examined and if it contains injected elements the library issues an alarm. The proxy library operates in two modes, training and production. During training, every vulnerable code statement is associated with a location-specific signature. This signature is a unique identifier that during production mode will determine if a CIA is taking place. Before generating and storing a signature the proxy library analyzes the code. Code analysis involves the complete removal of what is expected as user input, i.e., string literals and numbers, so that the signature is a template, and representative, of a class of user inputs, omitting only the actual input received-in which case it would be useless as a predictor. Then specific features related to the execution context are combined to create the signature identifier, which is registered as valid in a auxiliary table where all known valid signatures are stored. We describe these features in Section 5. After the signature generation, the application's normal execution flow continues. If the proxy application library is in production mode, the first two steps are the same with the training mode. The code is analyzed in the same manner and a signature is generated again. After the generation of the signature, the library validates it by checking if it exists in the table of valid signatures. If it does not, it means that an injection attack is taking place. The library prevents the execution of the injected code and specific details regarding the invalid call are logged. A key element of our approach is the efficient generation of location-specific signatures. The legitimate signatures produced in the training mode are based on features that when combined provide a unique identifier. Some of these features depend entirely on the code statement that is about to be executed. These include SQL keywords in the case of an SQL statement, XML attributes in the case of an XML code fragment, etc. Other features are independent of the code statements, but depend on the execution flow and environment: these include the caller method, its class name, the connection between the application and the database, the line number of the file that triggers an execution, and others. If it does, when a malicious user attempts an attack the injected code will lead to a signature that does not exist in the table and the attack will be intercepted. This requires the removal of actual user input from the signature generating function. As presented in Figure 3, this is done by the AnalyzeCode function. For this removal to take place the AnalyzeCode function follows the steps listed in Figure 4. To facilitate the handling of the signatures and ensure that they are not manipulated in any way, a hash function is applied to the combined elements before they are stored in the signature storage table. In earlier work, we demonstrated the validity of our approach for guarding against injection attacks on DSLs. Specifically, we showed how it can guard applications against two of the most common DSL-driven injection attacks, namely SQL and XPath [41,40]. The general architecture behind both mechanisms is presented as a UML communication diagram in Figure 5. In the case of SQL, our mechanism, "SDriver/SQL", is a JDBC (Java Database Connectivity) driver7 that adds the security properties of our approach against SQL injection. It acts as a wrapper around other connectivity drivers and it depends neither on the application nor on the RDBMS. To protect applications against XPath injection we implemented an XPath proxy library called SDriver/XPath. The proxy library depends on the java.xml. xpath2 package which provides an API for the evaluation of xpath expressions and access to the evaluation environment. In essence, SDriver/XPath wraps the default implementation of XPath and adds our security features. The library is application-independent, just like its SQL counterpart. Both mechanisms can be easily used by existing programs: a programmer needs to make only one change in the application's code to protect it. 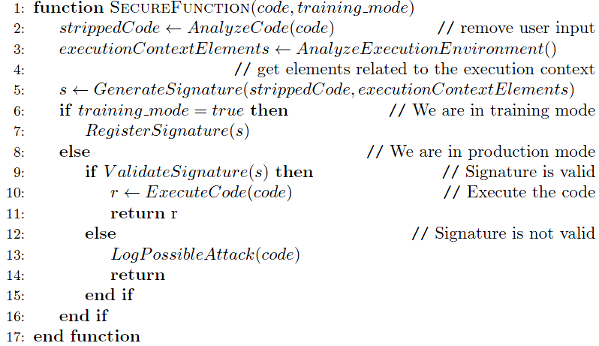 In our implementations, the signatures created during the training mode involve the stripped down statement (as presented in Figure 4) and a critical element of the execution context of the application, the method invocation stack trace. The stack trace is retrieved following Figure 6 (which is practically the implementation of the AnalyzeExecutionEnvironment function in the DSL context) and it includes the details of all methods and call location, from the method where a code statement is executed down to the target method of the connectivity driver or the XPath package. This same application could allow users to lock their terminal, but allow the unlocking either with the user's password or with the administrator password (the 4.3 BSD lock command behaved in this way). The corresponding query to verify the password on the locked workstation would be as follows. It is now easy to see that a malicious user could obtain the administrator's password by email by entering on the password retrieval form the string anything' OR 'x'='x as his user identifier. Without the the differentiating factor of a stack trace, the preceding query would have the same signature as the one used for unlocking the terminal, and would escape a traditional signature-based protection system. We have evaluated our tools in terms of detection accuracy and operation cost. For the accuracy testing we used simple synthetic benchmarks,8 notoriously vulnerable applications,9 and a bundle of previously evaluated real-world applications10 [23,46]. We attempted a wide variety of attacks based on incorrectly filtered quotation characters, incorrectly passed parameters, untyped parameters, tautologies, and others [2,26]. Our mechanisms successfully prevented all the attacks without suffering from false positives or negatives. To calculate the operation cost of SDriver/SQL, we measured the overhead by executing a complex SQL statement, with and without the mechanism. The operation cost measures the cost of the query execution inside the Java Virtual Machine, and not the cost of the execution in the database. During production mode it is below 35%; as the actual query execution time comprises the time spent in the database (and the transfer to and from it), the effective overhead to the user will be lower, depending on the complexity of the query. The SDriver/XPath library was tested for operation cost against the standard XPath library shipped with the Java Development Kit (JDK). To use the XPath library one must compile the XPath expression and then run it on the XML data. The results are returned as a list of XML nodes. Our approach adds the extra overhead only to the compilation phase, which is usually executed only once, if the developer follows good coding practices. The benchmark results showed that the library performed in average 93% slower in the compilation phase than the standard XPath library; similarly with SQL injection protection, depending on the complexity of the query and how compilation fares against execution, the relative delay experienced by the user will be less. Our scheme can be applied to all DSLs that are integrated into GPLs using the pattern Implementation:Embedding as proposed by Mernik et al . This is because this pattern includes all DSLs that are using an application library as their implementation scheme. A drawback of our approach in both mechanisms is the need for retraining after a new release. If the application's code is altered, the new source code structure invalidates existing query signatures. This is because stack elements contain information about a method invocation including the method name, the package, the file, and the line number. This necessitates a new training phase. an attacker will maneuver the user's browser to execute the code contained in the expr variable. Such an attack was used in the MySpace Samy XSS attack, which utilized eval to bypass the security measures taken by the community creators and automatically add the attacker to the victim's friends, while altering the victim's profile to add a copy of the attack code. The implementation of the stack traversal follows the same steps shown in Figure 6. To check the accuracy of our module we consulted xssed.com13 to find vulnerable, real-world web pages and attack them by utilizing eval. We performed tests on 3 top ranking sites namely: cnn.com14, dhl.com15 and reuters.com16. In all cases our mechanism prevented the attack without encountering any false positives or negatives. An advantage of the scheme compared to the one proposed for the dsl context is the fact that the need for retraining is not so frequent, as it is only required after a change in the code that alters the method call sequence. The training itself is not carried out by the user since the user cannot be sure that during the training the browser is executing legitimate code. A possible way to avoid this is to create the signatures server-side and pass them on the user-side during the users' first site visit via HTTPS. Unless an application is severely flawed, its vulnerabilities are likely to be located in a few places, and attackers wishing to exploit them are likely to try to "play around the rules". Such opportunities are rare, and their exploitation entails forcing an application to do something outside the normal course of events. Exactly because such abnormal behavior stands out from the application's normal conduct, it is possible to detect it and take protective action when it occurs. Our application takes advantage of this in order to prevent a broad class of injection attacks. To distinguish between normal and abnormal events, we identify and register vulnerable code statements using unique signatures that we generate during a training phase. Then, at runtime, our framework checks all statements for compliance with the trained model and can thus block code statements containing additional maliciously injected elements. The training phase can take place during regression and user acceptance testing prior to release, so that developers do not need to alter their working processes significantly. The approach introduces a runtime overhead, but the overhead compares favorably when related to the full execution cost of the protected statements; with complex statements, it will be negligible. The applicability of our approach to any GPL with eval capabilities hints at a possible generalisation to any GPL that is able to execute its own programs. For instance, there is no distinction between program and data in Lisp and its dialects. Although we are not aware of attacks on these languages, their variants are increasing in popularity. A disadvantage of our scheme is that when a signature feature is altered, a new training phase is necessary. However, with the increased adoption of test-driven development, and use of automated testing frameworks like JUnit, this training phase can be easily repeated. Despite warnings and advice for many years now, insecure software is still released. One reason is that developers are wary of incorporating into their practice cumbersome methods and unyielding tools. Countering that, our approach is easy to use, requiring minimal changes in existing code. Moreover, it can be extended to more domains and languages than the three shown here. The implementations of our libraries are available at http://istlab.dmst.aueb. gr/~dimitro/ssuite/. We would like to thank Chuan Yue and Haining Wang for sharing with us details of their SpiderMonkey instrumentation efforts. We would also like to thank Konstantinos Stroggylos, Georgios Gousios and Titika Konstantinopoulou for their insightful comments during the writing of this paper. This research has been co-financed by the European Union (European Social Fund - ESF) and Greek national funds through the Operational Program Ëducation and Lifelong Learning" of the National Strategic Reference Framework (NSRF) - Research Funding Program: Heracleitus II. Investing in knowledge society through the European Social Fund. Ashish Aggarwal and Pankaj Jalote. Integrating static and dynamic analysis for detecting vulnerabilities. In COMPSAC '06: Proceedings of the 30th Annual International Computer Software and Applications Conference (COMPSAC'06), pages 343-350, Washington, DC, USA, 2006. IEEE Computer Society. Martin Bravenboer, Eelco Dolstra, and Eelco Visser. Preventing injection attacks with syntax embeddings. In GPCE '07: Proceedings of the 6th international conference on Generative programming and component engineering, pages 3-12, New York, NY, USA, 2007. ACM. Mason Brown and Alan Paller. Secure software development: Why the development world awoke to the challenge. Inf. Secur. Tech. Rep., 13(1):40-43, 2008. Karl Chen and David Wagner. Large-scale analysis of format string vulnerabilities in debian linux. In PLAS '07: Proceedings of the 2007 workshop on Programming languages and analysis for security, pages 75-84, New York, NY, USA, 2007. ACM. Brian Chess and Gary McGraw. Static analysis for security. IEEE Security and Privacy, 2(6):76-79, 2004. Brian Chess and Jacob West. Secure programming with static analysis. Addison-Wesley Professional, 2007. Crispin Cowan. Software security for open-source systems. IEEE Security and Privacy, 1(1):38-45, 2003. Manuel Egele, Peter Wurzinger, Christopher Kruegel, and Engin Kirda. Defending browsers against drive-by downloads: Mitigating heap-spraying code injection attacks. In DIMVA '09: Proceedings of the 6th International Conference on Detection of Intrusions and Malware, and Vulnerability Assessment, pages 88-106, Berlin, Heidelberg, 2009. Springer-Verlag. David Evans and David Larochelle. Improving security using extensible lightweight static analysis. IEEE Softw., 19(1):42-51, 2002. Michael Fagan. Design and code inspections to reduce errors in program development. pages 575-607, 2002. James C. Foster, Vitaly Osipov, and Nish Bhalla. Buffer Overflow Attacks. Syngress Publishing, 2005. Aurélien Francillon and Claude Castelluccia. Code injection attacks on harvard-architecture devices. In CCS '08: Proceedings of the 15th ACM conference on Computer and communications security, pages 15-26, New York, NY, USA, 2008. ACM. Johan Gregoire, Koen Buyens, Bart De Win, Riccardo Scandariato, and Wouter Joosen. On the secure software development process: Clasp and sdl compared. In SESS '07: Proceedings of the Third International Workshop on Software Engineering for Secure Systems, page 1, Washington, DC, USA, 2007. IEEE Computer Society. Wei Hu, Jason Hiser, Dan Williams, Adrian Filipi, Jack W. Davidson, David Evans, John C. Knight, Anh Nguyen-Tuong, and Jonathan Rowanhill. Secure and practical defense against code-injection attacks using software dynamic translation. In VEE '06: Proceedings of the 2nd international conference on Virtual execution environments, pages 2-12, New York, NY, USA, 2006. ACM. Martin Johns and Christian Beyerlein. Smask: preventing injection attacks in web applications by approximating automatic data/code separation. In SAC '07: Proceedings of the 2007 ACM symposium on Applied computing, pages 284-291, New York, NY, USA, 2007. ACM. Nenad Jovanovic, Christopher Kruegel, and Engin Kirda. Pixy: A static analysis tool for detecting web application vulnerabilities (short paper). In SP '06: Proceedings of the 2006 IEEE Symposium on Security and Privacy, pages 258-263, Washington, DC, USA, 2006. IEEE Computer Society. Gaurav S. Kc, Angelos D. Keromytis, and Vassilis Prevelakis. Countering code-injection attacks with instruction-set randomization. In CCS '03: Proceedings of the 10th ACM conference on Computer and communications security, pages 272-280, New York, NY, USA, 2003. ACM. Kyung-Suk Lhee and Steve J. Chapin. Buffer overflow and format string overflow vulnerabilities. Software: Practice and Experience, 33(5):423-460, 2003. Benjamin Livshits and Úlfar Erlingsson. Using web application construction frameworks to protect against code injection attacks. In PLAS '07: Proceedings of the 2007 workshop on Programming languages and analysis for security, pages 95-104, New York, NY, USA, 2007. ACM. Gary McGraw. Software Security: Building Security In. Addison-Wesley Professional, 2006. Marjan Mernik, Jan Heering, and Anthony M. Sloane. When and how to develop domain-specific languages. ACM Computing Surveys, 37(4):316-344, 2005. Yasuhiko Minamide. Static approximation of dynamically generated web pages. In WWW '05: Proceedings of the 14th international conference on World Wide Web, pages 432-441, New York, NY, USA, 2005. ACM. Dimitris Mitropoulos, Vassilios Karakoidas, and Diomidis Spinellis. Fortifying applications against XPath injection attacks. In A. Poulymenakou, N. Pouloudi, and K. Pramatari, editors, MCIS 2009: 4th Mediterranean Conference on Information Systems, pages 1169-1179, September 2009. Dimitris Mitropoulos and Diomidis Spinellis. 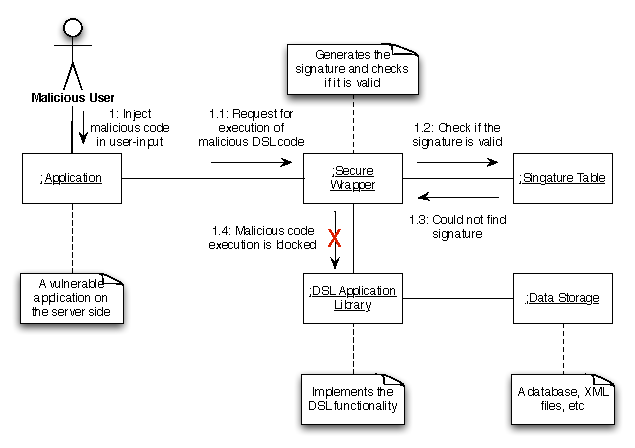 SDriver: Location-specific signatures prevent SQL injection attacks. Computers and Security, 28:121-129, May/June 2009. Susanta Nanda, Lap-Chung Lam, and Tzi-cker Chiueh. 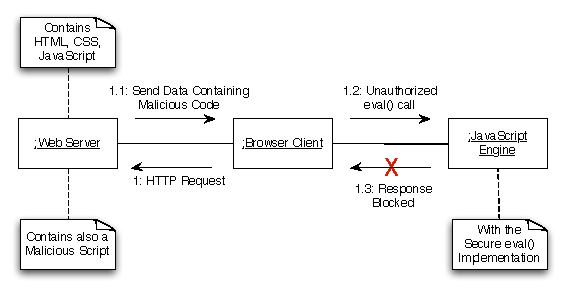 Dynamic multi-process information flow tracking for web application security. In MC '07: Proceedings of the 2007 ACM/IFIP/USENIX international conference on Middleware companion, pages 1-20, New York, NY, USA, 2007. ACM. Robert Seacord. Secure coding in C and C++: Of strings and integers. IEEE Security and Privacy, 4(1):74, 2006. Nuno Seixas, José Fonseca, Marco Vieira, and Henrique Madeira. Looking at web security vulnerabilities from the programming language perspective: A field study. In ISSRE '09: Proceedings of the 2009 20th International Symposium on Software Reliability Engineering, pages 129-135, Washington, DC, USA, 2009. IEEE Computer Society. H. Shahriar and M. Zulkernine. Mutec: Mutation-based testing of cross site scripting. In IWSESS '09: Proceedings of the 2009 ICSE Workshop on Software Engineering for Secure Systems, pages 47-53, Washington, DC, USA, 2009. IEEE Computer Society. Marianthi Theoharidou and Dimitris Gritzalis. Common body of knowledge for information security. IEEE Security & Privacy, 5(2):64-67, 2007. John Viega, J. T. Bloch, Tadayoshi Kohno, and Gary McGraw. Token-based scanning of source code for security problems. ACM Trans. Inf. Syst. Secur., 5(3):238-261, 2002. Xinran Wang, Chi-Chun Pan, Peng Liu, and Sencun Zhu. Sigfree: A signature-free buffer overflow attack blocker. IEEE Trans. Dependable Secur. Comput., 7(1):65-79, 2010. John Wil and Marjam Kamkar. A comparison of publicly available tools for static intrusion prevention. In In Proceedings of the 7th Nordic Workshop of Secure IT Systems, 2002. Glenn Wurster and P. C. van Oorschot. The developer is the enemy. In NSPW '08: Proceedings of the 2008 workshop on New security paradigms, pages 89-97, New York, NY, USA, 2008. ACM. 8Our testing was based on standard scenarios as described in http://cwe.mitre.org/data/definitions/643.html and http://projects.webappsec.org/XPath-Injection.